It was a fastball, a waste pitch left too far out over the plate. As soon as it left George Tyler's left hand, Babe Ruth picked up the ball's rotation, and his eyes lit up. With a sharp intake of breath, the young Boston Red Sox slugger stepped into the pitch. In his mind, the crowd at Fenway Park - 20,000 fans, staring, howling, imploring - fell away to silence as he cut the air with a ferocious swing. All he heard was hard wood hitting old leather. It sounded like a rifle shot. The ball went screaming over the second baseman's head, not rising more than 10 feet off the ground. In right field, Max Flack of the Chicago Cubs took one step in - then suddenly realized his mistake. He turned his back to the infield and started running as fast as he could. He leapt, but the ball sailed over his glove, bounced once and banged up against the bleacher fence. Fenway Park erupted. Straw hats sailed through the air. Scorecards and bags of peanuts flew skyward. Men slapped each other on the back and cheered their hero with lusty, proprietary roars. On the field, everyone was in motion: Flack chasing the ball to deep right field, Dode Paskert sprinting over from center, Charlie Pick coming out from second base to relay the outfielder's throw, Charlie Deal straddling third base, watching the action unfold. Boston runners George Whiteman and Stuffy McInnis crossed the plate, both turning to watch Ruth tearing around second, dead set on third. Babe slid hard into the bag - safe! Deal tossed the ball back to Tyler. The crowd yelled even louder. Ruth stood on the bag, hands on his hips, the ovation echoing in his ears. What a remarkable season it had been for the 23-year-old Boston pitcher. His dreams of playing every day finally had been taken seriously and he had thrived. His name had begun appearing in newspaper headlines around the country and hundreds of people came out to games for no other reason than to see him in uniform. For seven weeks in July and August, he achieved a streak of sustained excellence unmatched in baseball history. It was fitting that Ruth's first World Series hit was a triple, because deep in his heart, Babe knew that nothing felt better than smacking a three-bagger with men on base. As Tyler walked slowly back to the center of the diamond with his head down, the triple was replayed in 20,000 minds and its importance began to sink in. 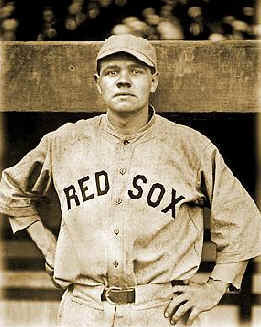 The Red Sox now held a 2-0 lead in Game Four of the 1918 World Series. Boston would go on to win the game 3-2, widening its lead over Chicago to three games to one. Two days later, on September 11, the Red Sox won their third World Series championship in four years, their fourth in seven seasons, and became the first team ever to win five World Series titles. Of course, none of the 15,238 people in Fenway Park that Wednesday afternoon could have known the significance that Game Six victory would eventually hold. If they had, they might not have filed out so quietly afterwards, their overcoats buttoned against the early autumn chill. If any of those fans could have foreseen the future, they might have lingered a little longer, tried to burn a stronger imprint of the game into their minds. Exactly two months later, the Great War in Europe would come to an end. No one could imagine that after that beleaguered 1918 season - a summer in which the eventual champions battled clubhouse dissensions, threats of a players' strike, the bumbling ineffectiveness of the game's ruling body, a possible shut-down of the game by the government, and a tragic, untimely death - Red Sox fans would wait and wait and wait - now 82 years and counting - for another World Series title.